Bindu Bhandari, aged 24, is a youth campaigner from Nepal. She is an undergraduate student in veterinary science faculty with a key concern in climate change and youth advocacy. 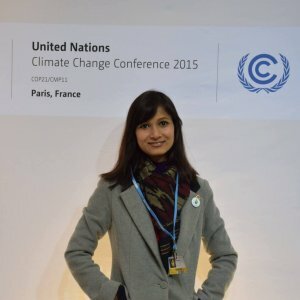 Besides being a World Climate Ambassador she is also enrolled as Asia Regional Officer for the Cop In My City Project of CliMates (an international think and do tank on climate change) and Regional Ambassador for Tunza Eco- generation (global environmental networking platform for youths) since 2015. For the last three years she has been actively involved in sensitizing youth for climate action at the grassroots level and leading various trainings and campaigns focused on students. She served as a core volunteer for Clean Up Nepal in 2014 and Secretary at Rotaract Club of Naraynagarh (international social5 organization) in 2015. She was attended COP 21 in Paris in 2015 on behalf of CliMates. For her commendable actions, she has been awarded with several national and international awards including Collegiate Ambassador for Peace Award by Universal Peace Federation, Best Regional Ambassador by Tunza Eco-generation, and Inspiring Volunteer Story by UN Volunteers Nepal among others. She aspires to pursue her career as climate policy analyst and advocate extensively on youth inclusion at all levels of decision making for achieving Sustainable Development Goals.